Christine DeRosa/Contributing Photographer Freshman guard Sam Sessoms set the court ablaze in his first appearance for Binghamton, compiling 27 points in 33 minutes of play against Cornell. 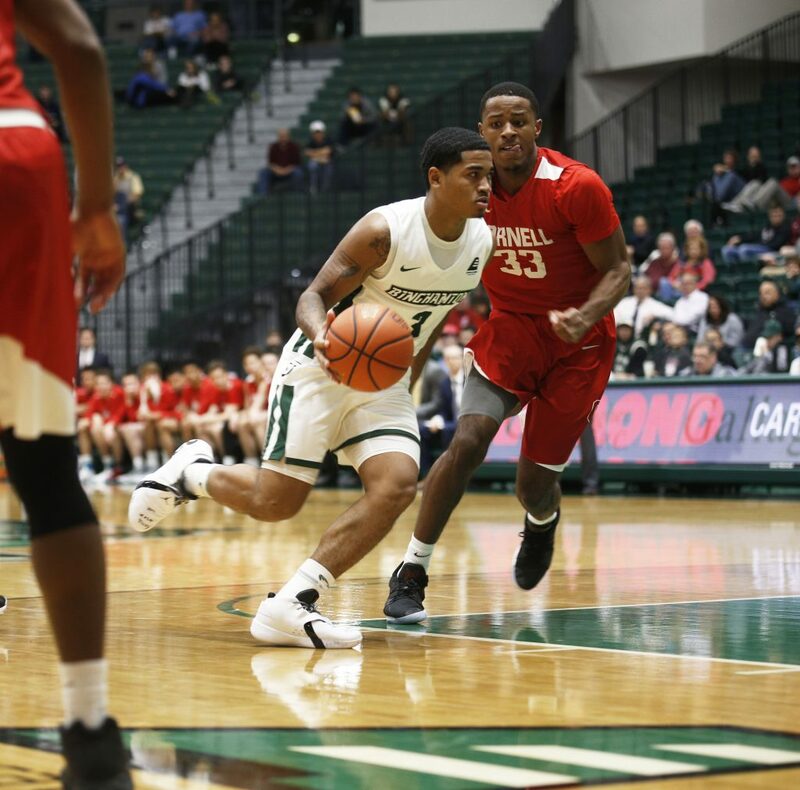 Even though the end result was an 86-75 defeat to Cornell, the Binghamton men’s basketball team opened its season in electrifying fashion Tuesday night. Freshman guard Sam Sessoms torched the Big Red with step-back 3-pointers, crossovers that put the crowd in a frenzy and pump fakes that left defenders in disbelief. He corralled five rebounds and posted 27 points, 16 of which came off 64 percent shooting in the first half. While Sessoms’ unquestionably sensational debut, which had him tied for the most points scored by a rookie in his first game as a Bearcat, caught the attention of the 2,108 in attendance, he certainly did not let his stat line cloud his judgment of the team’s performance. The Bearcats (0-1) allowed 49 points in the second 20 minutes compared to the 39 they scored. As for the team, Sessoms and several other new additions showed promising flashes, at least offensively. Junior guard Richard Caldwell, Jr. earned a start and contributed two triples, five boards and 12 points. The Bearcats’ offensive production was limited by their lackluster free-throw shooting, however. BU shot 3-7 in the first half and 3-10 in the second, leaving a costly total of 11 points at the line. On the defensive end, though, Dempsey’s squad struggled on multiple fronts. The Big Red (1-0) hovered around an efficient 45 percent from the field for the entire game, repeatedly beat Binghamton on backdoor cuts to the basket and forced 10 fouls in the first half alone. The most notable problem for the Bearcats was trying to contain senior guard Matt Morgan, who lit up BU with 38 points on 10-15 shooting. Morgan, a former All-Ivy League First Team selection and an early entrant to the NBA Draft in both 2017 and 2018, also dominated Binghamton on the glass with 13 boards and defensively with four steals. Morgan shot five for eight from beyond the arc and 13 for 14 from the charity stripe as well. Part of the defensive lapses were undoubtedly due to the absence of senior forward Thomas Bruce, who is currently out recovering from a concussion he suffered in the offseason. The former America East leader in blocks per game with 2.1 currently does not have a timetable for his return, yet Dempsey does not anticipate his offensive game plan will change much when he is inserted back into the lineup. Although the team came out of Tuesday’s opener with a loss, Dempsey seemed optimistic that the program is trending upward. Once Bruce and sophomore guard Tyler Stewart return from their respective injuries and fully integrate into this fast-paced offensive system, the team will have the potential to be competitive in most contests moving forward. The Bearcats will look to secure their first victory of the season when they take on the New Jersey Institute of Technology on Friday night. Tipoff is scheduled for 8 p.m. from the Events Center in Vestal, New York.